These days more than ever, it’s nice when you can make a dollar spent go farther. If you’re a fan of wild Northwest salmon and have an interest in supporting the livelihoods of the people who work to bring food to your plate, here’s a delicious opportunity for you to do good by eating well. 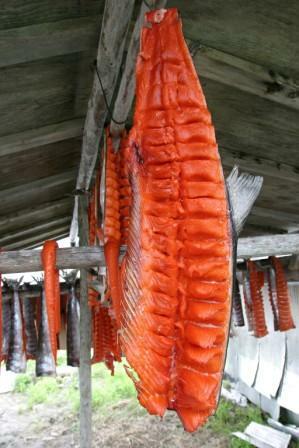 Thursday February 26, Elliott’s Oyster House is hosting a Yukon Salmon Feast to benefit the families where the Yukon River flows, source of those spectacular Yukon salmon. Elliott’s Oyster House on the Seattle waterfront has stepped up to the plate to help out. All this month, they’ve been donating 25% of every Yukon keta salmon entrée purchase to a fuel fund set up to support the Yup’ik Eskimos in Emmonak, on the Yukon River delta. The most basic necessities have been hard for families to manage in recent months: fuel, heating oil, food. CNN has a detailed item about it here. A special push of support for that same fund will result from the dinner on February 26, at which $25 of each attendee’s fee ($65 plus tax & tip) will go to the fuel fund. More information on both here. And you can check out a preview of the menu for the 26th. Call soon, seating’s limited! I know there’s no shortage of economic grief to go around these days. And so many fundraising invitations come our way as well. But this is one cause in which I take a particular interest. Because I’ve been to the village Emmonak, traveled to many of their fishing camps, visited other fishing villages in the area. I saw first-hand how remote they are, how incredibly meaningful and important the salmon is to the locals’ lives, how few other economic resources they have to draw on. The business of wild salmon harvest and distribution is a huge and complex subject and I definitely do not profess to have a solid handle on it. I just know what I’ve learned and observed from the travels and research I did while an editor at Simply Seafood magazine, and in years since working on my Salmon cookbook and other projects. My trip to the Yukon River, which thankfully came shortly before my Salmon manuscript was due, was by far the most eye-opening. My travel partner was great friend, and great photographer, Scott Wellsandt (these photos are all his). Some of his shots showed up in a New York Times article a couple of weeks later, written by Timothy Egan. The article included a photo of me holding a sizable Yukon king, though the shot I include here in the post is an outtake. Is the fish heavy? Yes. But it’s also alive, so I was having a heck of a time holding the monster and not accidentally dropping him back into the river. We were on a skiff with some Department of Fish & Game folks, they were checking their test-nets for a sampling of the salmon traffic to help determine seasonal openings. When people see that photo, they usually ask if I caught the fish, but I cannot tell a lie. I did not. I thought I knew what “remote” meant; only after that trip did the word’s meaning really sink in. The airplanes got progressively smaller, from Seattle to Anchorage, Anchorage to another lay-over, then on to Emmonak–population 700 or so–in maybe a 16-seater. The only way in or out is by air or by water. ATVs and motor bikes are the key mode of land transport in town (this time of year it’s snowmobiles, of course), a few really beat-up cars puttering around. We heard an awful lot of those ATVs, even to 2:00 in the morning with the sun still brightly shining and the kids thrilled to have extra hours of play. Do they never sleep during summer?? We were there early in June. The commercial season was not due to open for another week or two, but some subsistence fishing was going on. Over the next few days, we covered a lot of territory, traveling between fish camps to chat with folks, see their set-ups, watch them methodically cleaning, gutting the fish. We spent most of our time with folks from Kwik’pak, the buyer/processor based there to handle the fish caught by local families during commercial openings. In those fish camps, we often saw three, sometimes four, generations together doing the work of the day, mending nets, cleaning fish, tending to smokehouses, whatever needed to be done. 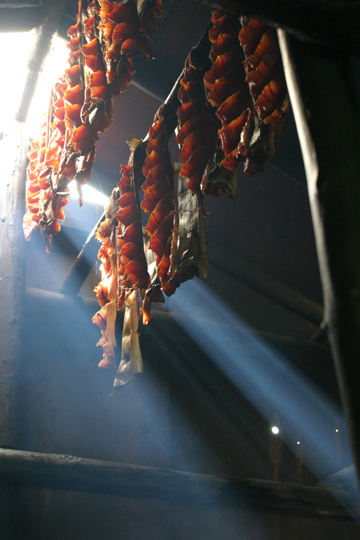 Fish they’d caught were being smoked, dried and otherwise cured to save for the winter. It was quickly clear that the subsistence fishing is by no means just a traditional ritual the Yup’ik observe. It is a vital means of supporting themselves on the flip side of the calendar, when the river’s long frozen and food provisions are far less easy to come by. I naively assumed that a research trip to the Yukon River while fish were being caught would mean some pretty phenomenal eating opportunities. But it didn’t take long to understand that the freshly-caught fish were far too valuable to just toss on the grill for dinner. We didn’t have one bite of salmon the whole trip, and I didn’t mind one bit. The people were all just wonderful, friendly, serious about the work at hand but quick with a welcoming smile. So generous. It broke my heart when news began spreading about the dire straights they’re in now. Both the subsistence catch and the commercial catch are vitally important to those communities. The former allows them to feed their families in months to come. The latter not only allows us to enjoy the glorious salmon from the Yukon, but provides cash income for the very high cost of living in remote reaches of Alaska. If you’re so moved to lend a hand, pick up your fork and find yourself some Yukon River salmon. This is a post I hesitate to start because, like gin below, salmon is a subject near and dear to my heart. It’s hard to not follow various tangents and tell lots of stories about my experiences with the glorious fish once I broach the subject. I’ll take it as a personal challenge to try and keep this brief. More will surely follow. they catch is subsistance supply that will feed them well into winter and early spring. 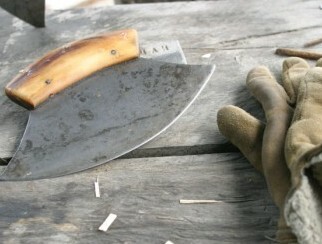 Fish are filleted and trimmed with ulu knives, laid over wood rods to dry and then smoke in their custom smokehouses. 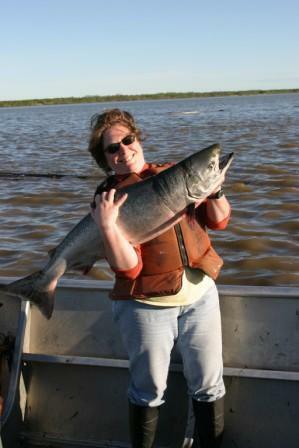 We’re due to be seeing Yukon keta salmon and kings beginning next week. It’s expected to be a lower than average season for kings, so availability may be limited. It’s might delicious eating though. 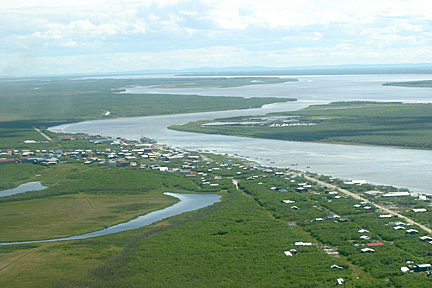 The Yukon river is 2,000-plus miles long, much longer than the Copper River for instance, so those fish really need to have a full tank of fuel (in the form of their delicious fatty reserves) to make it back up the river. That fat translates into rich flavor, something Yukons have in abundance. The folks at Seattle-based Marx Foods contacted me a few weeks ago asking permission to run a few recipes from my book on their web site (which is in process now, hopefully they’ll be posted soon). But they did go ahead an cook up a few recipe for photos, which are already posted, what a treat it was so see them. They’re running a salmon recipe contest right now, deadline is June 20, so if you have a killer way you cook salmon, pass it along. The grand prize is hard to beat: 3 separate 5-pound deliveries of wild salmon, one each in July, August and September. Get cracking on polishing one of your best recipes!